This is my first post in my badminton blog and thought I will start with a short review of Carlton Optimax Viper 9.5 that I bought in second half of 2011. This is a light racket weighing 76 to 78 grams without guts. 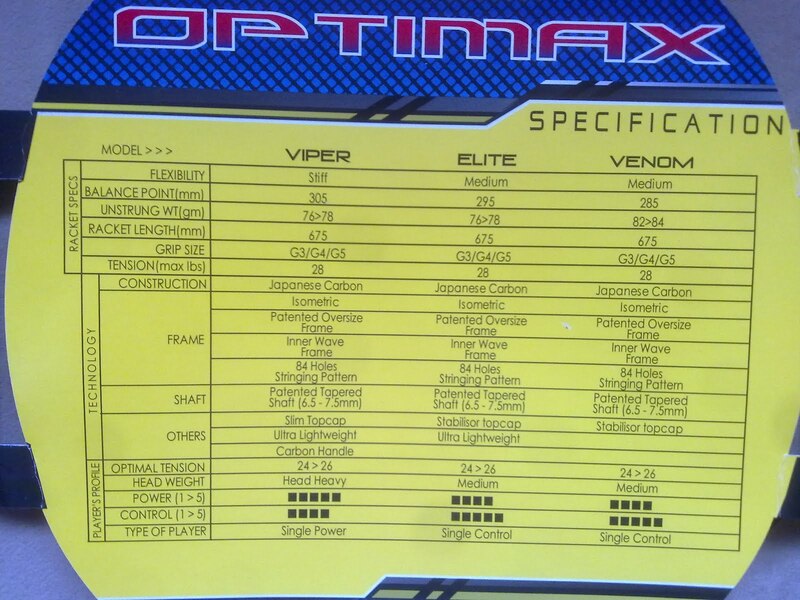 Grip size is G5. 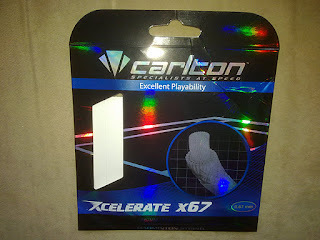 It came with Xcelerate x67 black color guts. Strung it at 30 and still not broken. I play only during weekends. 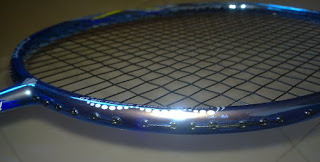 Color of the racket is blue with a shining finish. Looks like a sword. Came with a white thick Carlton grip. I had to put an over grip on this. It has a carbon handle. Need to hit hard to get a powerful smash. I had the guts strung at 30lbs, will try at lower tension once this gut breaks and provide further review on this. I am tempted to buy this but my game primarily comprises of hard smashes. It would be very useful if you could please post a few close up pictures of the frame so that the looks stand out. Can you also post a picture of the racket cover please? Also, how are you finding the racket now? From your pictures, I understand that it comes strung with tension of 28. Would you recommend this racket over other Carlton rackets? Rackte was unstrung. I have not used other Carlton rackets, hence I will not be able to compare. I am Yonex fan :). 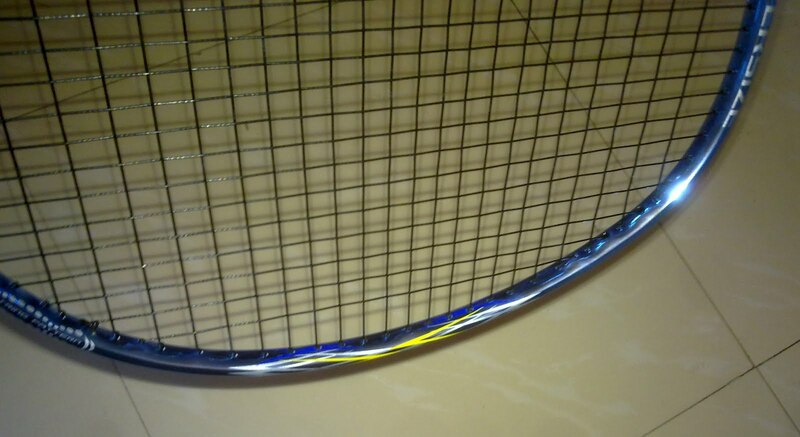 Racket was not strung when I bought it. Guts came along with the package and I got it strung at 30lbs. If your game comprises of fast smashes, you might be better off with a slightly heavier racket (again a head heavy one). 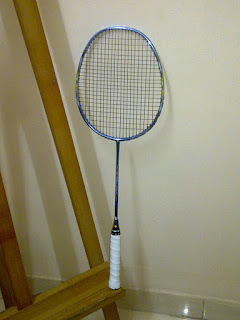 I also have a Yonex Voltric 80 and it is a super racket for smashes. I have read somewhere that it is a combination of Armortec and Nanospeed. Check out Voltric 80 at any Yonex store. Once the current guts break on my Carlton racket, I will get new guts on it at 25Lbs. Will post an update after that. HI, thanks for that. After much research I am leaning towards Yonex Voltric 70 or the Yonex NanoSpeed 9900. The decision now boils down between these two rackets. 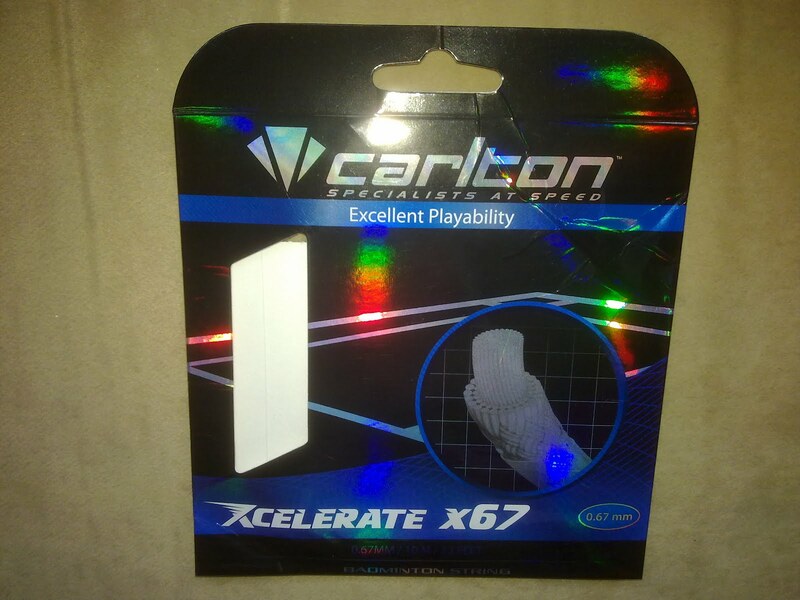 Which would you suggest being a Yonex fan (this will be my first Yonex product, however, I haven;t bought Carlton before either). I use Head rackets at the moment. Go for a 4U grip size in any case. 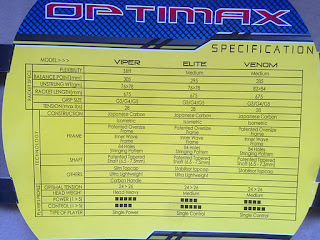 You can top up with overgrip if required.